A few weeks after a funeral you might begin to experience symptoms of anxiety, depression or overwhelming sadness. Family and friends who stood by you in your loss may have stopped calling and visiting. You feel alone. You have questions and concerns about how you will go on with your life. You miss your loved one. Grief support groups can help answer some of your questions. You can meet other people who have also suffered a loss and who are in various stages of grieving – who have figured out some solutions or have other questions you haven’t thought of yet. Some grief support counselors and groups are available at no charge or at very low cost. When family and friends don’t have the answers, grief support personnel often do. They can answer your very real concerns about picking up the pieces of your shattered life. Check with your local hospital for community service programs they offer. Accepts Title 19, provides monthly billing and/or sliding scale. Check with your local minister or church regarding local bereavement & grief support programs. 211 is an information line which offers assistance to you regarding community services that are available to everyone. Dial 211 from your home telephone. If you find a group that is helpful to you, let us know. We would appreciate your recommendations. 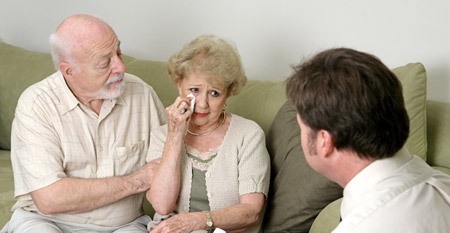 Mesothelioma.net is a cancer support group with a wide variety of resources about how to cope with a terminal illness, as well as extensive information about therapeutic practices and habits that victims and families alike can get involved with to help with the grieving process.. read more. Click here to download & print.